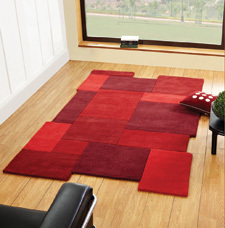 Abstract is a range that features funky shaped rugs in striped and squares designs. The rugs in this collection are made using an extra soft wool, which feels great underfoot, the pile is also very thick and very luxurious. Abstract is a funky collection of contemporary rugs, which is offered at great value.